Through twenty years of servicing Mercedes vehicles, we’ve seen that performing regularly scheduled maintenance is essential to retaining your newer Mercedes’ performance and reliability. Regular replacement of filters, lubricants, coolant, and other parts is critical. We also test for shifts in mechanical tolerances because even slight variations can cause drastic performance changes. 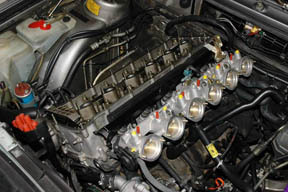 Maintaining a clean engine also helps keep the engine cooler, preventing premature failure of engine parts. Contact us today to ensure your Mercedes is up to date on routine maintenance checks. We honor most extended warranty programs.